HRC Launch Control: We're talking about a special ECU program here: push the button to select the mode, hold the throttle open, release the clutch, and the CRF250RX will do the rest, launching you into the first turn with a big advantage. It turns your bike into a holeshot-seeking machine! 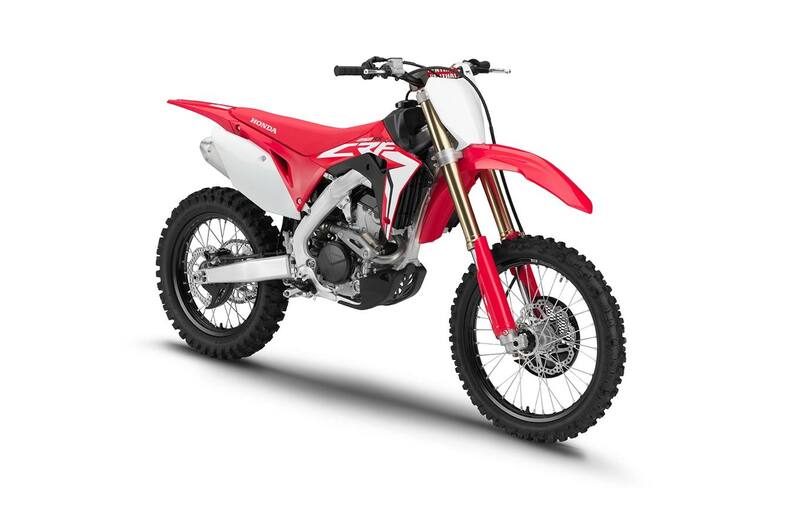 Electric Start: The new CRF250RX is equipped with an effortless electric starter. Convenient and lightweight, it's a huge deal if you need to restart a stalled bike in the heat of battle. DOHC Engine Layout: The CRF250RX uses a double-overhead-cam (DOHC) engine layout with a unique finger-follower rocker design. Together with the rest of the engine's architecture (bore and stroke, intake tract, piston, and more), you get more power and a higher redline. High-Capacity Resin Fuel Tank: For longer enduro loops, the CRF250RX features a bigger fuel tank that holds a full 8.5 litres. New Gear-Position Engine Mapping: Talk about smart: The CRF250RX features an ECU with special engine mapping for each gear. You can't give an inch in this class, so having your engine deliver optimal power for each gear choice is one of the features that separates CRF250RX riders from the rest. Titanium Intake and Exhaust Valves: Light is right when it comes to a high-revving engine's reciprocating masses. That's why the CRF250RX uses titanium intake and exhaust valves. Plus, the valve angle is a super-narrow 20.5 degrees (included). Ovalized valve springs and long-wearing Diamond-Like Carbon (DLC) treated finger rockers complete the package. Downdraft Intake and Exhaust Layout: The DOHC cylinder-head design let our engineers straighten out the CRF250RX's intake and exhaust tracts. The intake is shorter and just about arrow straight, and the exhaust flows more efficiently too. No athlete's going to win a sprint if he tries to run while holding his breath, and it's no different with your bike's engine. You'll experience both more power and better throttle response. 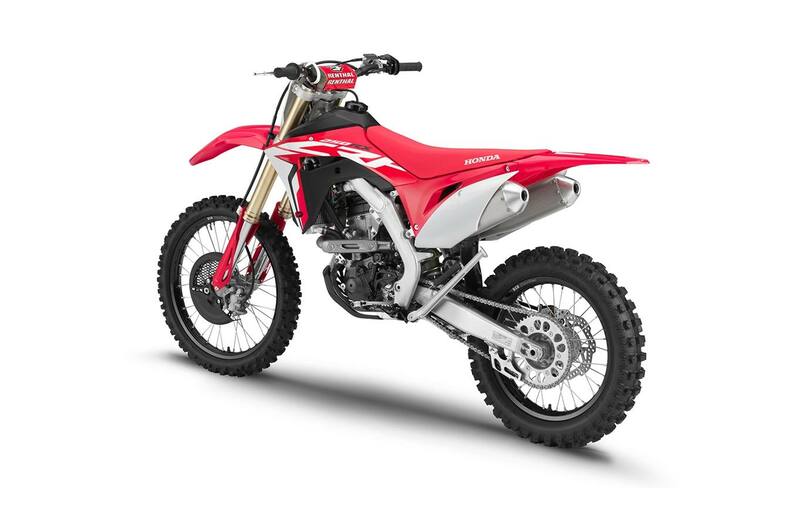 Big Bore/Short Stroke: The CRF250RX's 79 mm bore and short 50.9 mm stroke let our engineers create a high-revving engine with plenty of room for large valves. The engine breaths and revs—the two keys to making power in the enduro world. 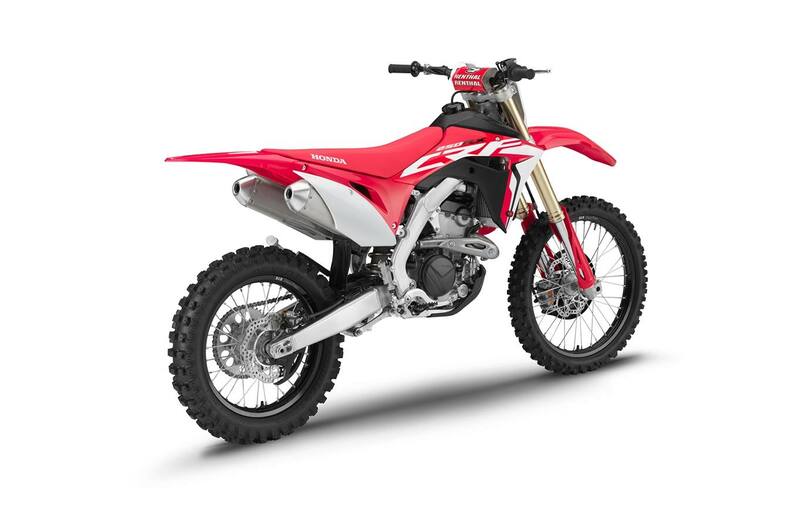 Dual-Exhaust System: The CRF250RX's dual-exhaust system is light, compact, and positioned close and low in the frame to take weight off the rear end and bring more mass to the bike's center for improved handling. It also allows for more airflow, and that equals added power. Bridged-Box Piston: The new CRF250RX features a bridged-box piston design developed on our factory racebikes. Why? The reinforcing structure between the skirts and the wrist-pin bosses lets this big-bore piston retain a light, strong construction and helps enable the CRF250RX's high redline. Total Air Management: Total air management means complete attention to how efficiently air gets through the intake, through the head, and out the exhaust. Eliminate losses here, and you make more power everywhere. And the best part? It's free power—you just need a bike with smart design. “H" Section Crank: Look closely at the CRF250RX's crankshaft profile and you'll see its “H" cross-section design. What's up with that? Just like a structural “I" beam in an aircraft wing or a skyscraper, it boosts strength and cuts weight over a conventional crank's shape—a big deal when you consider this part spins at over 14,000 rpm! 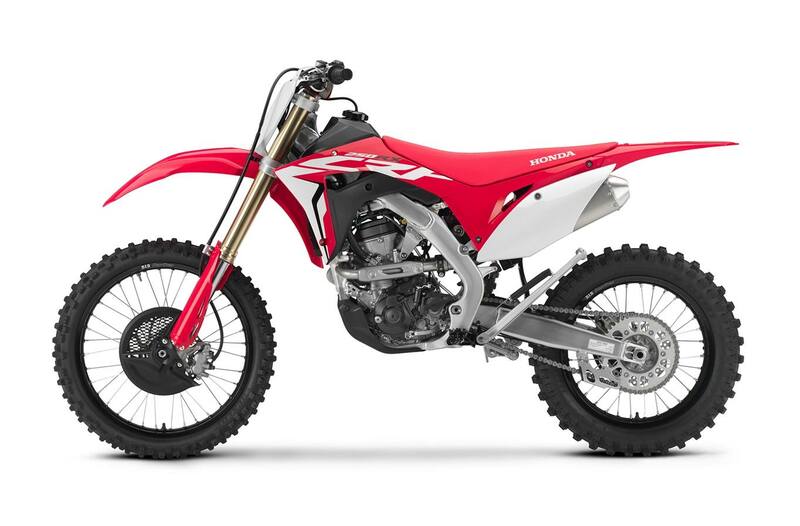 Gradual Pipe-Bend Radius: Notice how the CRF250RX's dual exhaust pipes make gradual, large-radius bends out of the head, then flow straight back to the mufflers with no abrupt angle changes. Getting the exhaust out of the engine—while still maintaining a tuned exhaust length, is the key to power, while the pipes' low mass and twin-silencer design optimize the CRF250RX's center of mass for superior handling. 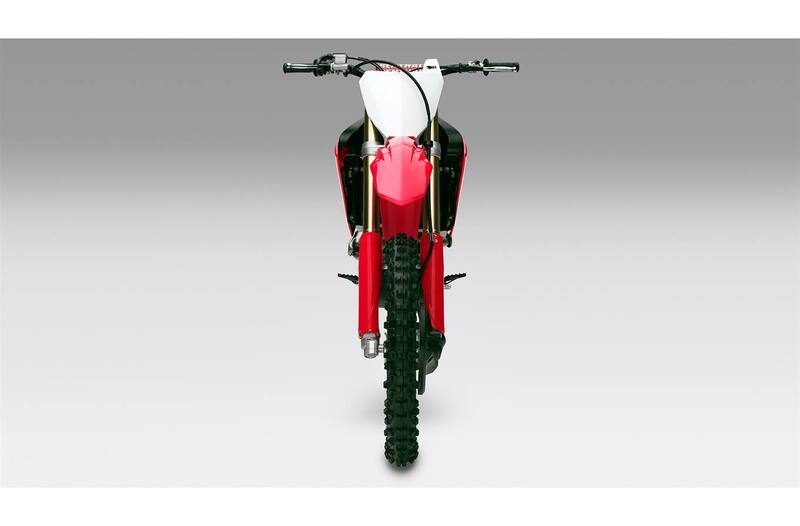 Clutch Design and Materials: The CRF250RX's clutch uses two different types of friction material. Why? The clutch can handle the increased power of the engine without being any larger. The lighter rotating weight is directly related to how fast the engine revs. Lithium-Iron-Phosphate Battery: Like the rest of the CRF250RX, the bike's Lithium-Iron-Phosphate battery is both super light and high performing. In fact, it weighs less than half the weight of a conventional lead-acid battery. Engine Oil Scavenge Pump: Deep in the engine, there's a special oil scavenge pump. While you may never see it, it helps keep the CRF250RX's overall design compact. New 2019 Cam Profiles: With input directly from our HRC works team, we've given the new CRF250RX the same cam profiles on our 2019 CRF250R. You should feel the engine rev more freely, as well as improved torque feel in the bottom end. New Throttle Body: With a 2 mm smaller venturi designed to speed up airflow, the CRF250RX's new throttle body really reaps benefits at low engine operating speeds. You get power and snap, right now. 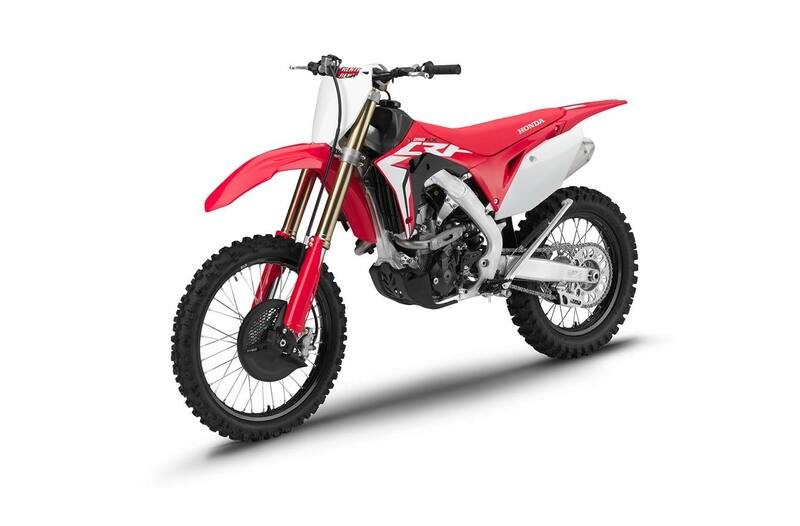 Large Valve Diameters: The CRF250RX's valves don't just have impressive lift, the valves themselves are large-diameter too—33 mm intakes and 26 mm exhausts. Combined with the high lift, the twin-cam CRF250RX flows a lot more, especially at high revs when you're wicking it up. New Double-Spray Injector Settings: The CRF250RX's fuel-injection system sprays twice per intake cycle. That helps increase fuel atomization without adding the weight or complexity of a second injector. The better fuel atomization means more power in the midrange and on overrev—you'll feel it the first time you ride. High Redline: With our better-breathing DOHC design and the big-bore/short-stroke engine, the CRF250RX's rev limit is way impressive. The same goes for peak power and peak torque. Smooth Styling: Blending the CRF250RX's body panels does more than just make the bike look smooth, fast, and stylish. It also helps you move around on the bike while riding. Nothing wrong with smooth, fast, and stylish, though. “In Mold" Graphics: With the all the time you'll be spending in victory circle, you need to look your best. The CRF250RX has you covered. Our “in mold" graphics look great, and stay looking good longer. 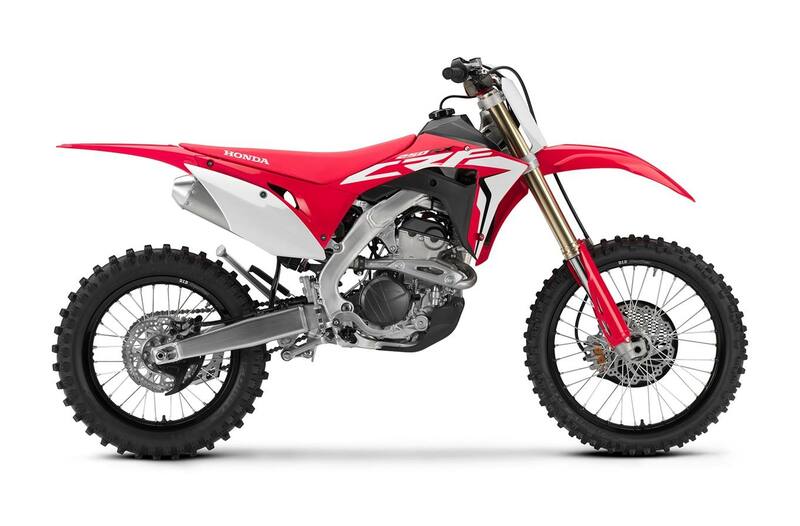 Rear Subframe: The 2019 CRF250RX's subframe uses extruded rear members that produce a 20-percent reduction in weight versus the previous generation CRF250R. Since that weight comes off the top of the bike, it also contributes to the CRF250RX's low center of gravity. Black Rims: They may not help you go faster, but the sweet black DID® rims sure look good. Sidestand: Real enduro bikes need a sidestand, and we've given the CRF250RX a great one. Tucked up high and out of the way, this forged alloy piece is just another example of how the CRF250RX gets it right. Showa Spring Fork: The 49 mm Showa fork features a conventional spring design that helps increase the CRF250RX's front-suspension precision, handling and feel. The 39 mm piston diameter and 25 mm rod diameter guarantee a plush feel and supple action. 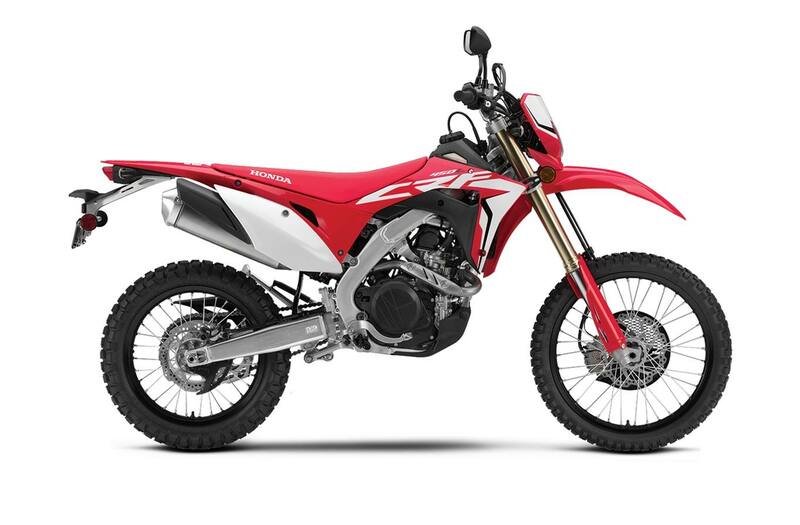 Short Swingarm: The CRF250RX's short swingarm helps make it light, and also helps give the bike better rear-wheel traction, important considering how much power you have on tap. The design also reduces the bike's unsprung mass. Dunlop Geomax Tires: The CRF250RX's Dunlop Geomax tires are specially designed for enduro use. The AT81 tires are spec'd at 80/100-21 for the front and 110/100-18 for the rear. You read that right: the CRF250RX rolls on an 18-inch rear wheel.